According to a list posted on the Wyomissing Public Library’s website, all students in 11th grade Honors English were required to read Nathaniel Hawthorne’s The Scarlet Letter over the summer, and choose from either The Handmaid’s Tale or John Gardner’s Grendel for their second book. At a curriculum and technology committee meeting last Thursday, acting superintendent Lynette Waller said the district would add a third optional book, as yet unspecified. The book descriptions on the lists sent home with students will also be rewritten “to better describe any graphic or possibly offensive material,” according to the Reading Eagle newspaper. Even though it was already optional, six parents had demanded at a school board meeting last Monday that Atwood’s dystopian novel be removed from the reading list altogether. One said that her daughter was “uncomfortable, disturbed and confused” after reading the book, and another said that it should only be assigned if students are offered concurrent mental health counseling. 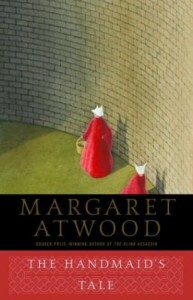 In recent years The Handmaid’s Tale has also been challenged as an AP English assignment in Albany, Oregon and as a summer reading book for seniors in another Pennsylvania school district, Ringgold. In the latter case a member of the school board memorably responded to a teacher’s suggestion that the board should read the entire book before taking action with “I don’t read Penthouse and I won’t read this.” The board hastily voted to remove The Handmaid’s Tale as a summer reading assignment at that time, but immediately had second thoughts and reinstated it at the following meeting.